Protestors burn the American flag. This week’s patriotic memorials honoring President George H.W. Bush stand in contrast to a chapter of his presidency where flag-burning, a practice which he abhorred, became a cemented right in two U.S. Supreme Court cases. Bush was a World War II Navy pilot and the last American chief executive to serve in combat. A decorated public servant, he sought to prohibit flag burning while serving as the nation’s 41st chief executive. “The 20th century wars were still vivid in the public imagination,” making the flag a sacred national symbol, former Solicitor General Ken Starr, who argued one of the two Supreme Court cases on behalf of the Bush administration, told Bloomberg Law. Respect for the flag and other patriotic symbols also was a top-tier political issue at the time. Bush leveraged this during his successful presidential campaign, criticizing his opponent Michael Dukakis for vetoing a bill requiring teachers to lead children in the Pledge of Allegiance while governor of Massachusetts. Dukakis explained unsuccessfully that he’d done so because he thought the law was unconstitutional. Once in the White House, Bush was up against the realities of governing and the First Amendment, not a rival politician. The two U.S. Supreme Court rulings in 1989 and 1990, both early in Bush’s lone term, definitively established the legality of the practice, said Sheldon H. Nahmod, of Chicago-Kent College of Law. The decisions, which split the court, 5-4, were “wildly unpopular” with the American public, said constitutional scholar Geoffrey R. Stone of the University of Chicago Law School. There was a sense of outrage following the Supreme Court’s first opinion that reflected in Chief Justice William Rehnquist’s emotional dissent to the decision to overturn a Texas court ruling forbidding desecration of the flag, Starr said. Bush also was emphatic in his disapproval of the decision just months into his term. From a First Amendment perspective, Texas v. Johnson, was an easy one because it criminalized conduct based on the view-point and content being expressed, Nahmod said. Or, as Stone put it, the law prohibited only the “desecration” of the flag, meaning that burning a flag to start a fire for warmth would not have been precluded but burning it for protest was. Following the decision, “all hell broke loose in Congress,” Nahmod said. Numerous items were proposed, including a resolution decrying the ruling as wrong. Bush was persuaded by legal advice from the Justice Department that only a constitutional amendment would get around the Supreme Court’s concerns, and called for one, Starr said. In the end, the Democratic-led Congress overwhelmingly passed bipartisan legislation against flag burning, the Flag Protection Act. Nahmod said that measure sought to get around the Supreme Court’s ruling by focusing the law on maintaining the flag’s “physical integrity,” rather than the reason for burning it. Bush didn’t sign it, but didn’t veto it either. He correctly surmised trouble ahead. “I have serious doubts that it can withstand Supreme Court review,” Bush said. “Nevertheless, because this bill is intended to achieve our mutual goal of protecting our nation’s greatest symbol, and its constitutionality must ultimately be decided by the courts, I have decided to allow it to become law without my signature,” he said. Despite Bush’s concerns over the constitutionality of the flag burning law, his administration defended it in front of the justices. The Justice Department determined that there were reasonable arguments that could be made in support of the law, said Starr, who was then the solicitor general. The court, though, didn’t buy this attempt either, Stone said. Just 10 days shy of Johnson‘s one-year anniversary, the same lineup of justices struck down the federal law. “Although the Flag Protection Act contains no explicit content-based limitation on the scope of prohibited conduct, it is nevertheless clear that the government’s asserted interest is” related “to the suppression of free expression,” and “concerned with the content of such expression,” the court said in a decision that broke along non-ideological lines. Several attempts to pass a constitutional amendment since that decision have failed. 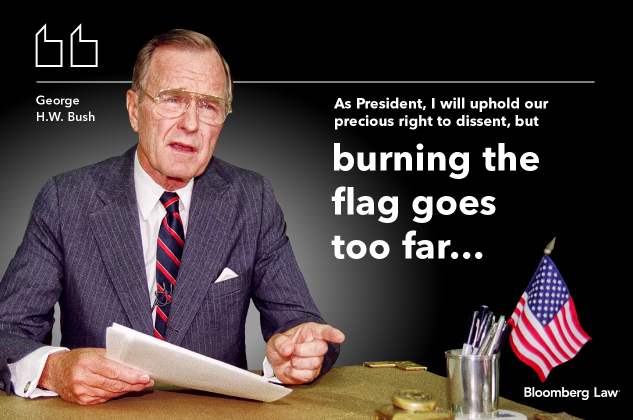 Bush’s strong criticism of flag burning, as well as the similar views held by liberal Justice John Paul Stevens, aren’t surprising in light of their World War II service, Stone said. Nahmod, who has written on flag burning, noted that support for a ban has reemerged in recent years. President Donald Trump in 2016 suggested stripping Americans of their citizenship if caught burning the flag. Since taking office, however, he has stoked a different patriotic controversy—that of athletes kneeling for the National Anthem.